MANILA, Philippines - With barely a month left prior to the filing of their Certificates of Candidacy (CoC), former DILG Secretary Mar Roxas III, Senator Grace Poe-Llamanzares and Vice President Jejomar Binay has tightened the race to become the 16th power in Malacañan Palace come 2016 as they are now ‘statistically tied’ for first place in the recent SWS survey. Conducted last September 2 to 5 with a total of 1,200 respondents from various areas nationwide, the survey which was commissioned by BusinessWorld asked the respondents on who among the twelve political figures on the list they provided will the respondents vote if the elections will be held at this point of time. 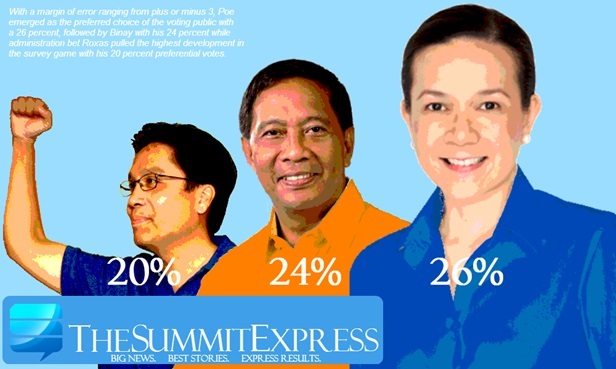 With a margin of error ranging from plus or minus 3, Poe solidified her position as the preferred choice of the voting public with a 26 percent, followed by Binay with his 24 percent while administration bet Roxas pulled the highest development in the survey game with his 20 percent preferential votes. The survey was done a month after President Noynoy Aquino anointed Roxas as his preferred successor to his throne at Club Filipino last July 2015. 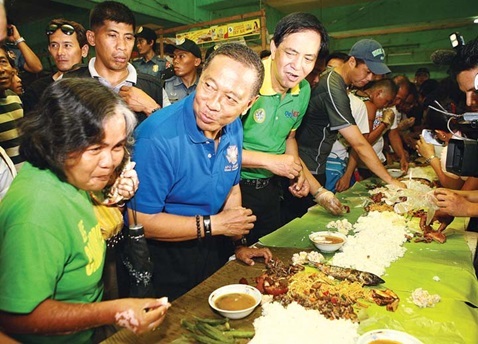 Together with that as well as the launching of his campaign for the continuation of Aquino’s ‘Daang Matuwid’ program, the LP stalwart has finally reached the wider radar of the public. 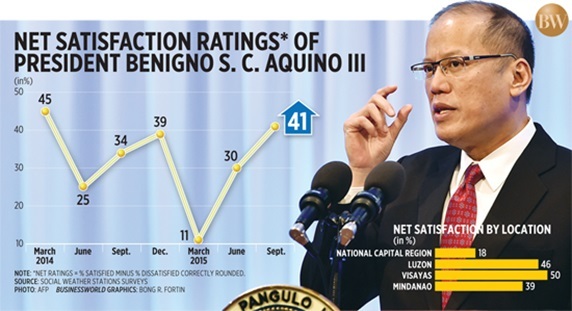 The high approval rating of PNoy may have lifted his numbers too in some ways which is also being seen as one of the ingredient why the Liberal Party appears to be still cohesive despite some reports saying that some of its members are jumping off to the Nationalist People’s Coalition which is believed to back Poe. Although the trajectory of his popularity has now gained momentum, the sustainability of Roxas’ rating is now the next concern. Issues of his incapacity to address the Mamasapano clash, victims of Typhoon Yolanda, the hellish Metro Manila traffic and poor transportation system plus what his detractors are throwing on him as a ‘trying-hard-magpakamasa’ image will always follow him if he will not be able to make an overhaul look for the public. On the other hand, Roxas may seem to retain his status as a stronger candidate come next survey results due to the brewing team-up of him with Congressman Leni Robredo of Camarines Sur who is being seen as to fill the gap vacated by Poe when she decided to run against Roxas. On the other hand, survey frontrunner Senator Grace Poe-Llamanzares who has recently ended the speculation on what will be her final stand in the upcoming election is now enjoying a good view from the top. The survey was done prior to her public announcement to run as president so it can be expected that the next surveys to come will project higher digits for her, which might provide her stability as the presidential frontrunner. 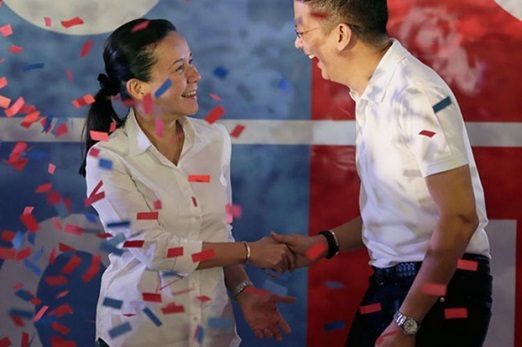 However, Poe’s proclamation as an alternative of the administration received mixed views with Senate President and LP Chairman Franklin Drilon saying that although Poe is correct that there should be no monopoly with the ‘Daang Matuwid’, she has to find her own political battle cry as the straight path governance type has been identified so well with Aquino and Roxas. Also, Poe is yet to solve another potential waterloo of her presidential run that is her citizenship which is currently being tackled by the Senate Electoral Tribunal and her recent statement alluding to the sentiments of the Iglesia ni Cristo on which the public highly disapproves of. The real challenge for Poe to win in this game of throne is to prove her identity, capacity to lead and wash away the insinuation that she will just be manipulated by people around her as well as stating clear solutions on how to solve the problems that is paining the mass. And finally with Binay, who may now getting the shock with his falling numbers on recent surveys. However, upon examining the figures, Binay's current situation is still safe. He may have fallen behind Poe and Roxas is inching closer towards him but the embattled vice president knows that among the three of them, his number has a more solid and stronger foundation. By analyzing the previous surveys, Roxas has always been fluctuating in the pulse of the mass while Poe is yet to experience a real ride in the survey after formally joining in the race. Meanwhile, Binay has been steady in combatting corruption issues being thrown to him and his family with measly reasons which irritates his detractors further. In spite of his steady performance in the rating game, Binay should start making some adjustments on how to deal with the public especially with the media. He has already been vilified by various reports and if he continues shrugging things off, landing on the 3rd spot may not be a far-fetched idea anymore.